Every page you publish in Landing Lion lives on a domain. 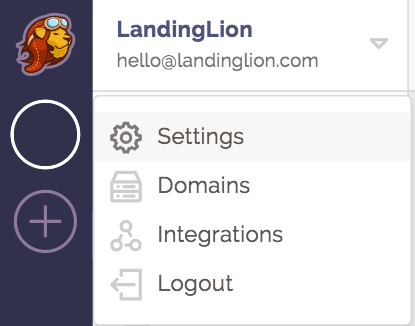 When you first sign up, a subdomain is created for you on landinglion.com. For example, if you signed up under "Delightful" the subdomain automatically created for you would be delightful.landinglion.com. All pages you publish will go under the URL, delightful.landinglion.com. If you create a page named "About" your page would live at delightful.landinglion.com/about. Here, "about" in the URL is the page slug. Alternatively, you can publish your page under any domain you already own. 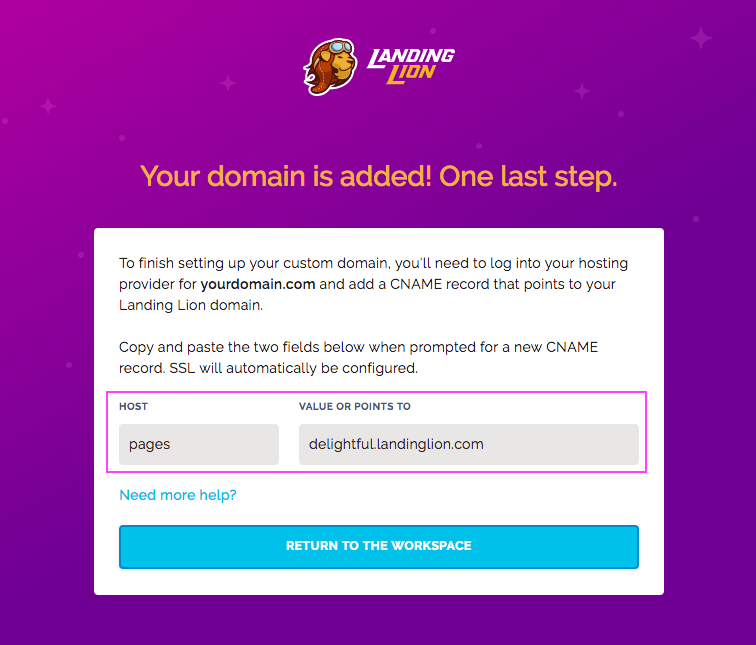 A domain that you own and add to Landing Lion is called a "custom domain". You only have to set up a given custom domain once. ⚠️ NOTE: Premium plans provide different amounts of custom domains allowed. 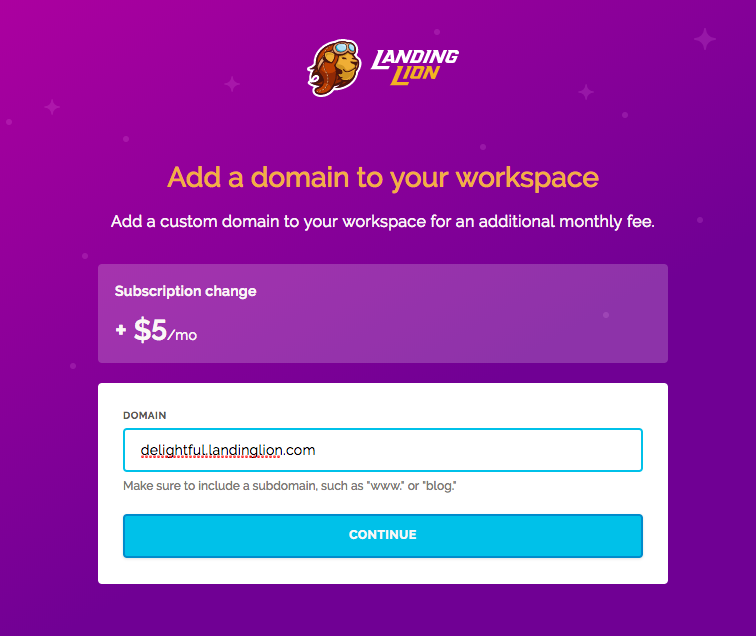 If the total number of custom domains you want exceeds the custom domains included in your pricing plan, you can add new domains to your account for an additional $5 per month for every additional domain. 3. Click the "Add A Domain" button in the top right to open the New Domain modal. If you have an existing website that you don't want Landing Lion to interfere with, you will need to use a subdomain other than "www" for your custom domain. For example, if your website is using www.rockets.com for it's domain, the custom domain you need to use for Landing Lion would be something like, sales.rockets.com. The subdomain can be anything you would like it to be, as long as it's not "www" in this example. If you would like your pages created in Landing Lion to serve as your main website, you can then go ahead and use www.rockets.com for your custom domain. 5. Once you click "Continue", a modal with the "Host" and "Value Points to" fields with values will appear. 6. You'll need to copy the "Host" and "Value or Points to" from these fields and use them when you go to your domain provider's website. 7. Now you will need to add the CNAME record in your domain providers DNS settings. Open a new tab and log in to your domain provider's website. Go to the part of their website where you manage your DNS settings (you might have to go an advanced settings section). Now find where you can edit or add CNAME Records – sometimes called Host records or Alias records. If there are any existing records where the "Host" value is the same as your subdomain (i.e. www), you will need to delete those before adding your CNAME of the same "Host" value. Add a new CNAME record with the "Host" and "Value or Points to" values you were given above. ⚠️ NOTE: If you are using "www" as your page's subdomain, you will also need to add a redirect in your DNS settings that point the root domain (i.e. delightful.com) to www.delightful.com. This will ensure that your visitors will get to the proper subdomain, even without typing in "www". You're almost done! The last and final step is to use your verified domain on your page(s). 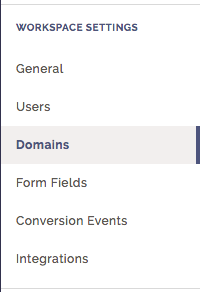 To remove a domain, go to your Custom Domains list and hover to the right of the domain you want to remove. Click the trash can icon to remove it. If any pages are using the custom domain, you must first edit the URL for each page to use a different domain before being allowed to remove the domain.